This specific heavy duty 2mm radius hand held corner rounding punch weighs under 14 ounces & cuts up to approx 5/64″ thick (75 mils) paper, PVC cards or laminated paper material. This punch large steel cutting blade and extra wide side guides to make seating your sheet very simple. This is the deluxe tool of choice for many game counter clipping users. The tiny radius takes just enough off to remove sharp corners without disturbing printed info. In addition, you also need to move the counters in the map as long as the game progresses. The fingers may be too thick to do this task, in particular when you have high dense area of counters with several stacks. In order to assist with this problem, some wargamers use some tweezers. 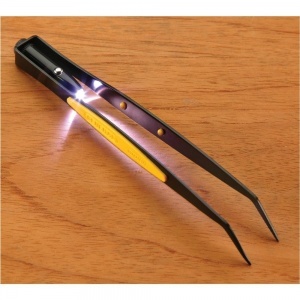 As with the corner punch cutter, there are several types of tweezers. The one we usually use has a specific bent tip and have a light emitting diode which makes them useful to illuminate specific parts of the map or visualize easily the digits and letters written on the counters.